The MMS1 patch is another way to use MMS1 and DMSO topically. This is not the same as Protocol 3000 per se, but it is a variation of how to use MMS1/DMSO externally in an effective way to heal all types of skin issues. We have had success with many types of tumors, cancer tumors, and infections such as MRSA, diabetic ulcers, and other skin diseases. It has brought relief to pain areas especially when cancer is present. While Protocol 3000 is one way to absorb chlorine dioxide into the body, through the skin, the patch is designed to target a specific area of the skin. Note: See page 265 for instructions on preparing an MMS1/DMSO patch for a child. 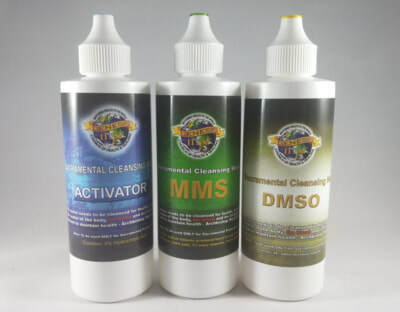 In a clean bowl activate 10 drops of MMS with 10 drops of 50% citric acid or 4% HCl. Count 30 seconds for activation. Immediately add 10 drops of purified water. Then add 10 drops of DMSO. Make sure this solution is mixed well. Pour the solution onto a cotton gauze pad making sure the liquid is fully absorbed into the pad. Cover the problem area with the gauze pad and leave for seven minutes. The first time you do this patch, I suggest applying it for only seven minutes in order to test how the skin reacts. If it goes well, then the next patches can be held on for 15 minutes each time. If the skin is overly irritated, adjust the solution as described in the notes below. It is best to hold the patch in place as putting tape on the soaked gauze pad could have a reaction with the DMSO. After the allotted time, remove the patch. Notes If the above steps cause any burning or irritation to the skin, add 10 more drops of water to the patch. If 10 drops of water doesn’t stop the burning on the next patch, add another 10 drops of water, and keep adding more until there is no burning or irritation. Depending on the size of the area to be covered, this formula can be doubled or tripled, or cut in half accordingly. Apply once or twice a day until well.